Most people are aware that overheating breast milk can significantly damage the nutritional and immunological value, but do you really know how hot is too hot? Well, it’s a much lower temperature than you might think. There are lots of great resources out there about handling breast milk, most of them written by doctors, and you should definitely take a look at some of those resources. Most of them will advise you to heat milk in a bowl of warm water. How can anybody screw that up? ...Well, as new parents, we definitely did. I now realize that as an adult who drinks hot beverages all the time, my idea of “warm” is actually much too hot. The temperature at which breast milk should be served is what most adults would consider lukewarm. Use a bowl of warm water: Not-too-hot tap water changed out once or twice should bring milk from refrigerator temp to body temp within a few minutes. Easy enough! Use a bottle warmer: Baby Gear Lab recommends the Kiinde Kozii, which has a unique and sophisticated mechanism to prevent overheating. Mason jars will fit inside this model, so it’s a great pick if you are using the Mason Bottle. Share with other caregivers: Whether you go with the bottle warmer, or keep things simple with tap water, be sure to share this information with your child’s caregivers and with other parents. Explain that you don’t “heat” breast milk, you just sort of “lukewarm” it =) The reference temperatures listed above are very helpful if you really want to put in perspective how hot is too hot, or rather, how warm is too warm. One final note: You may be asking yourself, what about defrosting breast milk? 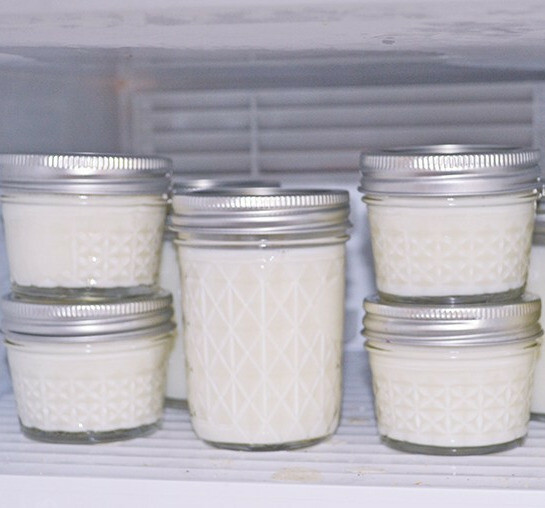 Whenever possible, allow milk to thaw by simply moving a jar of milk from the freezer to the refrigerator, and letting it defrost over time. But if you need to make a bottle ASAP, and your only option is milk that’s totally frozen, just know that rather than putting the milk in very hot water, your best bet is warm water and a little waiting. *It's also worth mentioning this ins't a sponsored post and we don't have an affiliation with babygearlab.com. We just thought that, on this particular topic, the information they provide is quite helpful!